We saw it hit the streets in the EU with a name that only a mother could love, but this European "Rebel" has now become the latest Arai Defiant to hit the US roadways in 2013. The Arai Defiant Helmet takes much of its inspiration from the classic features of your typical Arai, but adds a muscular yet refined twist in a few key areas. The changes are claimed to add comfort, style and stability to riding naked bikes or urban streetfighters. 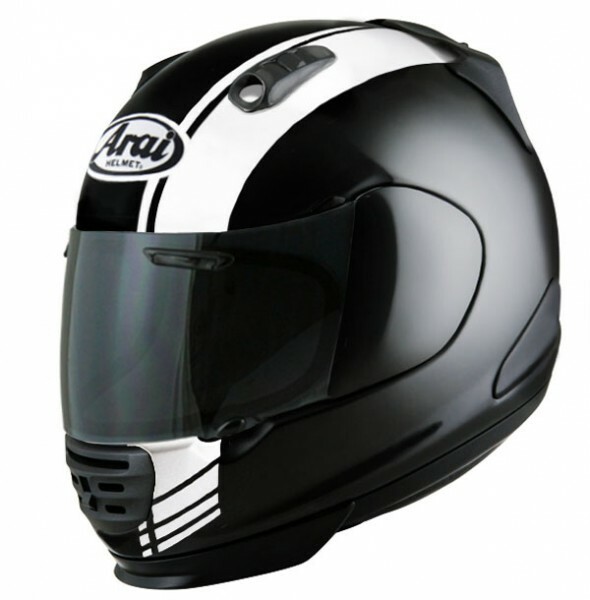 Outside of the new looks, which include redesigned chin and top vents, Arai also gave the neckroll and "side skirts" a new look to tie this menace all together. If European models can be any indication, the new graphics look great at first glance. I am very interested to get out and ride one on a Monster or Super Duke to see if there really is a true benefit when joined with an unfaired bike or a three-quarters riding position. Expect to see the Arai Defiant Base (right), Arai Defiant Character and the Arai Defiant Asteroid lead the launch into the US, this Spring. If it strikes your fancy you can always watch our detail breakdown video of the Arai Defiant. More to come as we get the scoop.